being yourself in a very friendly open air festival dancing 3 days and nights ! 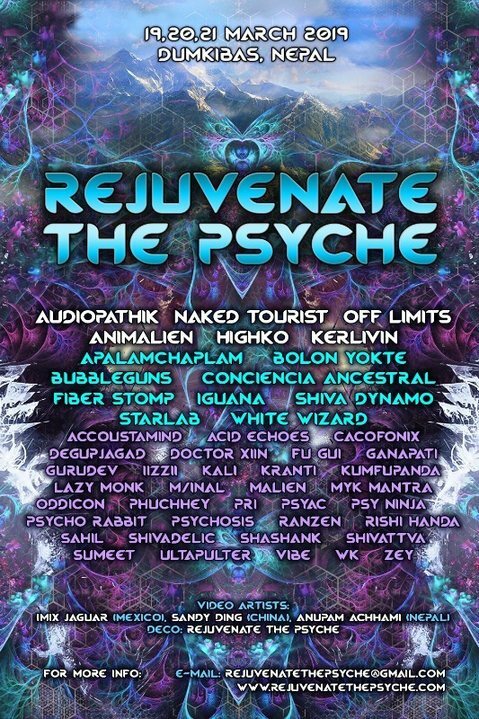 Dancing under the warm spring skies to the best Psychedelic Goa Trance music, given to you by am amazing line up of some of the best psychedelic Dj’s and Live acts from all over the world ! Experience art in the form of psychedelic music deep with in the foothills of Nepal surrounded by mesmerising mountains that will rejuvenate your innermost self , connect you with like minded soul, feel the rhythm of the magical forest and leave you satiated! Destinations - Pokhara - Palpa - Butwal - one hour Dumkibas Event Venue. Destination - Bharatpur Airport and Bhairahawa airport . Event venue one hour away from both the airport. WHERE CAN YOU BUY THE TICKETS ? - Goa Shack, Cyber Height Villa Club House, Cyberjaya, Selangor. - De La Soul, Thamel, Kathmandu. - Beta House Thamel, Kathmandu. If you would have to purchase Tickets Online (E-Tickets) please email to us at rejuvenatethepsyche@gmail.com .